It’s been a long time since a book made my heart pound. Don’t pick up The Marsh King’s Daughter unless you’re ready to read until finished. Once this novel gets rolling, you’ll sacrifice sleep to see how it ends. You know that meme that notes that it was more important to finish your book than to be mentally present the next day? That’s The Marsh King’s Daughter. Sleep be damned, you’ll be rooting so hard for Helena that you’ll forget the time. The Marsh King is a well known child abductor. He was serving time in a maximum security prison for kidnapping a 16-year old and making her his bride. For 14 horrific years, they lived together in a marsh. The kidnapped teen had a daughter, and that girl lived with her kidnapped mother and her abductor father for 12 years. The girl, Helena, had no idea who her father was, or what the outside world had to offer. All Helena knew was how to hunt, track, fish, and survive in the wild. For all intents and purposes, she was feral. Eventually, Helena and her mother escape the clutches of “Jacob” the Marsh King, and he was sent to prison for his crimes. Jacob escapes. The police find Helena. All hell breaks loose. Helena, now a mother herself, has thus far hidden her true identity from her family. Her husband had no idea that she was born two years into her mother’s captivity. Her two daughters had no idea that it’s a miracle that Helena actually survived her own childhood. All they know is that she’s a loving mother who runs a small business selling homemade jams and jellies. Helena must now come clean regarding who she is. Unsurprisingly, she is now on high alert that Jacob will come for her and her family. She sends her husband and daughters away from their home, and does the most logical thing she can think of. She starts to track her father. The reader then watches two stories unfold: Helena’s childhood, and Helena’s race to find her father following his violent break from prison. Each story line could be a separate book. Each one paints an incredible picture of pure evil (Jacob) and astounding bravery (Helena). How many novels have you read where the protagonist gets to be a jaw-dropping hero, not once, but twice? How many literary characters get to prove their worth as a warrior once as a child, and then again as an adult? What kind of woman never loses her cool, consistently thinks before she acts, and gleans critical knowledge out of the most dire situations? Most importantly, who puts herself in harm’s way without a moment’s hesitation to protect those she loves, rather than cowering and waiting for someone else to save the day? If it sounds like I’m swooning over Helena, it’s because I am. I had such faith in her fortitude and her resourcefulness that I was convinced she could rescue anyone from any situation. 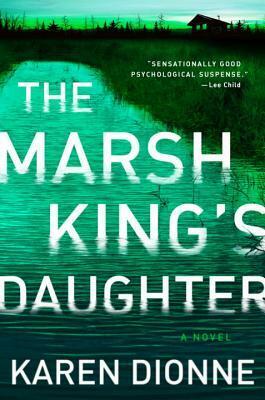 What’s fantastic about The Marsh King’s Daughter is the fact that it’s a character study as well as a thriller. You’ll be on the edge of your seat while simultaneously learning what makes the characters tick. Helena is unquestionably the most interesting. The marsh where she was raised was haunting and unforgiving, but it never seemed to frighten her. Her mother was of little influence to Helena’s upbringing, and yet Helena is wholly present for her own daughters. Rather than becoming deranged from such an unsettling childhood, Helena developed an unwavering inner strength. The pieces that comprise her are jagged and dark, and the resulting person is calm, deliberate, rational… and ruthless. She is her father’s daughter. And she’s coming after him. Please go out and get this book. And then get yourself some strong coffee. You’ll need it in the morning. 4.5 stars for The Marsh King’s Daughter. More specifically… 4.5 stars for Helena. Will have to add to the pile for consideration for our book club? Good idea! Will be a pretty fast read for everyone. Oh my goodness! I just finished reading this and was blown away. GREAT read! Holds your attention. Makes you think. So true! This book is perfect for a lively book club discussion.